There have been high winds sweeping across parts of the UK causing havoc and even causing some serious accidents. With the winds sweeping around debris, dirt, and leaves are being swept into gutters and they cease to work because they are blocked. Whilst the high winds have been sweeping the UK we have had an influx of people making orders and purchasing our Hedgehog Gutter Guard. They are protecting themselves and their gutter against the debris and stopping blockages from occurring. These are an extremely durable polypropylene bristle filter which is densely wound around a robust Stainless Steel spine and when this is inserted into the guard it blocks any twigs, leaves and debris from blocking the gutter as it fills the space but still allows water to flow freely. 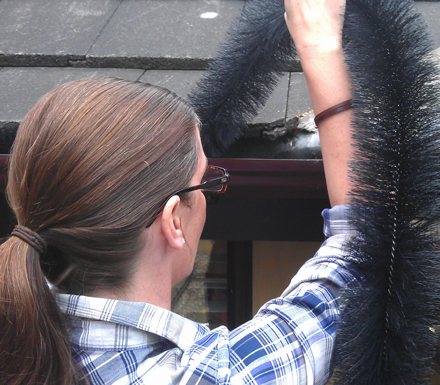 Hedgehog Gutter Guards are extremely easy to install as well as really quick too. All you need to do is slide in the guard and sit it in the cutter. There is no need for you to drill any holes, screw or fix. The bottle-brush-like guard bends around any corners and so there is maximum protection but as mentioned water is allowed to flow. Protect your gutters from blockages today call us on 0845 1236007 or email info@twistfix.co.uk.